(Photo: UNAIDS)Religious leaders and faith-based organizations meet to discusss HIV and AIDS in Ukraine with UNAIDS in February 2015. GENEVA - The first consignment of vital antiretroviral medications for adults and children living with HIV in war-stricken zones in eastern Ukraine has arrived by air in the conflict-torn country, says the United Nations. In Ukraine where government forces are facing Russian-backed separatist forces in the east of the country U.N. agencies such as UNICEF that protects children, and UNAIDS are working with faith-based and other groups to fight the scourge of HIV and AIDS. There are 230,000 people living with HIV in Ukraine says the International HIV/AIDS Alliance. "Marginalised and criminalised groups, particularly injecting drug users, are most at risk of HIV infection. "Although the number of new infections is decreasing in Ukraine, recent political instability and the influence of Russia is putting programs that aim to protect drug users from HIV infection at serious risk," says the alliance. UNICEF said Aug. 17 that a first shipment of life-saving ARV medications arrive in eastern Ukraine, that some in the west of the country refer to as the "occupied parts." The arrival of the treatment medicines followed the recent signing of a $3.7 million agreement between UNICEF and the Global Fund to Fight AIDS, Tuberculosis and Malaria. The agreement looks to the emergency provision of HIV supplies for adults and children living in non-government-controlled areas in eastern Ukraine. In February representatives of the All-Ukrainian Council of Churches and Religious Organizations (AUCCRO), a united forum of 19 confessions and faiths, which has put asside political differences in the war-hit country, met in Kiev. There they highlighted the urgent needs of people affected by HIV in eastern Ukraine. With support from UNAIDS, the meeting was attended by senior religious leaders and faith-based organizations from 19 different confessions and religious faiths. Also present were people living with HIV, civil society, government officials and other national stakeholders. The Archbishop of Chernihiv and Nizhyn, Ukrainian Orthodox Church of the Kyivan Patriarchate, called for urgent and coordinated efforts across all faiths to support people affected by HIV during the conflict in eastern Ukraine. "We consider the HIV epidemic as one of the major challenges for our society in this critical time," said Archbishop Yevstratiy (Zorya) of Chernihiv and Nizhyn. "During this humanitarian crisis, we confirm our commitment to the AIDS response and to doubling our support for people affected by HIV." The UNICEF agreement enables the continuation of ARV treatment for one year - for more than 8,000 adults and children living with HIV and of HIV testing for over 31,000 pregnant women and their children. UNICEF's close cooperation the Medicines Patent Pool, the All Ukrainian Network of People living with HIV and selected ARV drugs manufacturers has also resulted in major costs savings and acceleration of procurement. "The history of the AIDS response in Ukraine is the story of people fighting for their lives. These are people like me that today, more than ever, look to churches and religious leaders for guidance and support," said Dima Sherembey, head of the Ukrainian Community Advisory Board for the All-Ukrainian Patients Association at the February meeting. The health of thousands of children and adults in the conflict-affected zones of Donetsk and Luhansk will be at risk if their daily dose of ARV (AIDS fighting drugs) are interrupted, UNICEF has warned. When treatment is stopped, even temporarily, an HIV-positive person will be at higher risk of developing drug resistance, may progress to AIDS or die. If a pregnant HIV-positive mother's treatment ceases, her own health may suffer and her baby may be more susceptible to infection. "Disrupting the secure and safe delivery of supplies and medicines to conflict-affected zones can be a death sentence to people living with HIV," said Craig McClure, UNICEF Chief of HIV/AIDS. "The health and survival of vulnerable children, women and men should be held above geopolitical disputes." "Through committed partnership, we are focused on the vulnerable communities who need the supply of critical medicines to continue. "This is absolutely essential to the health and wellbeing of people living with HIV in eastern Ukraine," said Maria Kirova, the Global Fund Department Head for Eastern Europe. The southeastern regions of Ukraine, including Donetsk and Luhansk, have the highest prevalence of HIV in the country at 644 cases for 100,000 people. 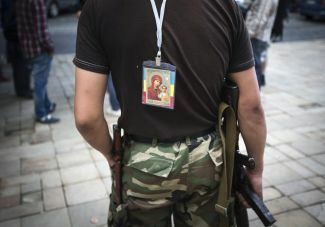 (Photo: REUTERS / Shamil Zhumatov)A religious image is hung on a back of an armed pro-Russian separatist guarding the regional administration headquarters in Luhansk June 18, 2014. The armed conflict in eastern Ukraine has further threatened the health of HIV-positive children and adults. Nearly 14,000 adults and children living with HIV are residing in areas that are not under government control, 8,000 of whom are at risk of having their treatment interrupted. The treatment of people living with HIV in other parts of the country will be safeguarded by the regular grant from the Global Fund and additional funding from Ukraine's State budget. UNICEF will purchase the needed medications and test kits and will support their distribution. "We are working with our partners from the government, UN and civil society to provide much-needed assistance to children and adults living with HIV," said Marie-Pierre Poirier, UNICEF regional director for Central and Eastern Europe and the Commonwealth of the Independent States.